I dont know what to call this trick but its classic Jay over the channel no helmet. Rick Steam Boat Charnoski is standing behind him. Later in the day we had the great idea of everyone holding my feet while I lay upside down on my back in the channel to take a photo of Jay flying across over head. This is all we got….. 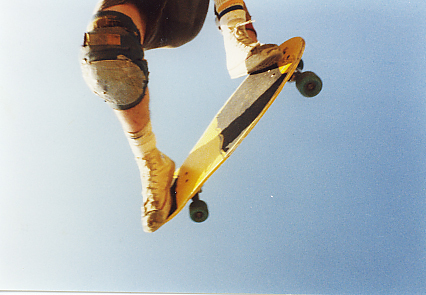 This entry was posted in 1986, Jason oliva, Jay Henry, Photos by Jason Oliva, Rick Charnoski, SKATE VIDEOS, TEAM STEAM, The Erasure ramp and tagged ART, backyard ramps, boards, east coast, jason, Jason oliva, jasonoliva, Jay Henry, New Jersey, New York City, oliva, pA, paintings, photography, pool Skating, ramp, ride, sk8, sk8t, skate, skate decks, skate history, skate photography, Skate ramps, skate trucks, skate wheels, skateboarding, skateboarding history, skateboarding photography, skateboards, skatepark, skater, SKATERS, steam, Street Skating, TEAM STEAM, The Barn, The House of Steam, thos, vert, vert ramps, Vert Skating on January 4, 2007 by jasonoliva. The only time I ever saw Jay wear a helmet was at CCCC. He does the craziest layback airs you will ever see and always pulls them. 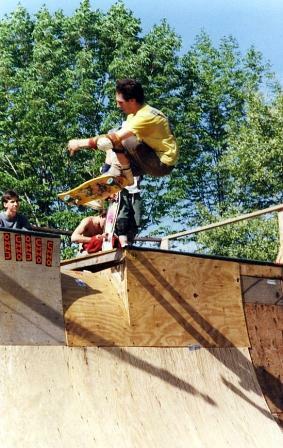 This was at a ramp nearby The Slug in Pa that Steamboat brought myself, Dan Tag, Stevie D, and Jay to. He called it the Erasure ramp because the locals always seemed to play Skinny puppy and Erasure. more pictures from this session to come. This entry was posted in 1986, Jay Henry, Photos by Jason Oliva, SPOTS:, TEAM STEAM, The Erasure ramp and tagged ART, backyard ramps, east coast, jason, Jason oliva, jasonoliva, New Jersey, New York City, oliva, paintings, Pennsylvania, pool Skating, ramp, ride, sk8, sk8t, skate, skate history, skate photography, Skate ramps, skateboarding, skateboarding history, skateboarding photography, skateboards, skatepark, skater, SKATERS, steam, Street Skating, TEAM STEAM, The Barn, The House of Steam, thos, vert, vert ramps on October 3, 2006 by jasonoliva.